I immediately knew I had put in too much milk so I compensated by upping the ice cream, chocolate and raspberry content. It eventually ended in me adding 3/4 of the entire tub of ice cream to bring it to any sort of a milkshake consistency. It was quite nice, considering I had to drink the best part of a litre of the stuff. Next time it'll be less milk and I'll be making it later in the evening so I can justify firing a few lashes of Bailey's into it. That'd be the business. 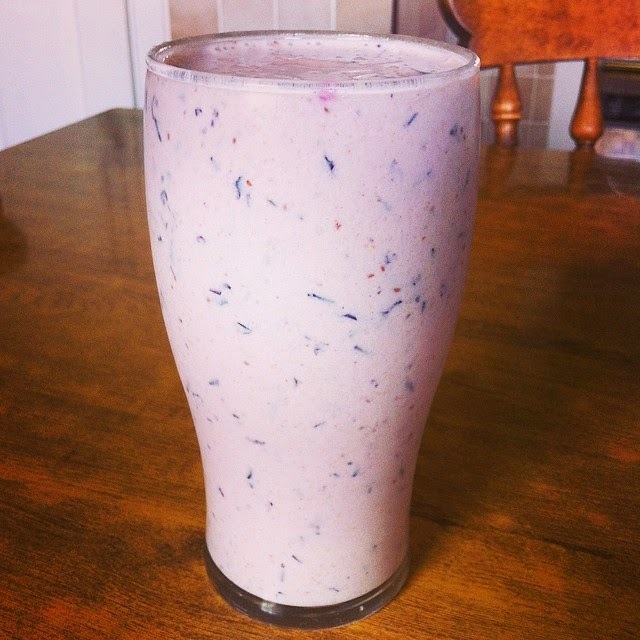 Milk, plain yoghurt, a banana and frozen blueberries. It's a quality drink. A drop of Bacardi will give it a lift if consuming after 6pm. Now I've tried this lad with a spoon of peanut butter thrown into the mix and while not bad I feel it best to treat peanut butter as you would a fine whiskey, ingested only neat, unsullied by the creations of God or men.